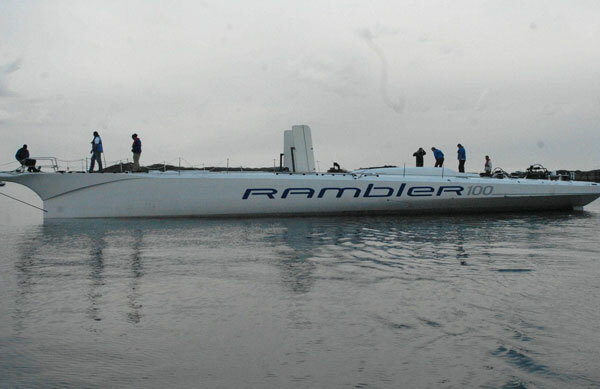 A SALVAGE team successfully righted the 100 ft maxi yacht Rambler 100 off west Cork last night following its capsize during the Fastnet yacht race earlier this week with 21 crew on board. The hull was being pumped out yesterday evening before the yacht was towed into port without its mast and rigging. Seán Harrington of Atlantic Towage and Marine Ltd of Castletownbere, Co Cork, said the location of the mast on the seabed had been identified and marked. Divers examined the condition of the hull of the Rambler 100 off Barley Cove near Mizen Head in good weather conditions yesterday morning, also retrieving bags and personal items. It took several efforts to upturn the hull, which is believed to be sound. The canting keel mechanism which allows the keel to pivot was fitted to the hull in a watertight box. It had originally been planned to use the deep-sea tug Ocean Bank, owned and run by Mr Harrington, to tow the hull from its location several miles south of Fastnet Rock into Bantry Bay on Tuesday night, where it could be lifted out at Castletownbere fishing harbour. However, in talks with the owner, it was decided that the stricken vessel should be anchored off Barley Cove for diver inspection. The yacht, owned by US multi-millionaire George David, had been leading in its monohull class and had just rounded the Fastnet Rock on Monday evening when it lost its keel and turned turtle. All 21 crew, including Mr David and partner Wendy Touton, were rescued, but Ms Touton – who spent several hours with Mr David and three others in the sea – was flown to hospital with severe hypothermia before being discharged. The Marine Casualty Investigation Board has begun its preliminary inquiry into why the canting keel snapped, resulting in a sudden loss of stability. Its surveyor has spoken to the crew, some of whom left to travel home yesterday. Others were awaiting emergency passports. The board has been liaising with the Cayman Islands authorities, where the maxi yacht, worth $10-$14 million (€6.9-€9.7 million), is registered. The Fastnet race host club, the Royal Ocean Racing Club, is also co-operating and holding its own review. The yacht’s own satellite beacons did not activate until some 10 hours after the capsize, but a personal emergency position indicating radio beacon worn by one of the 21 crew alerted Scottish and Irish rescue agencies. A US SAR Map program driven by wind, wave and current data supplied by Clare-based meteorological firm Nowcasting helped Valentia Coast Guard in Co Kerry to locate the missing crew. The successful rescue was effected by the Irish Coast Guard, the Baltimore Royal National Lifeboat Institution and a Baltimore dive company vessel, Aquaventures. The 608-mile race is continuing between the Isle of Wight, the Fastnet Rock and Plymouth, with the last of the fleet expected to finish at the end of the week.